Tranter is one of the world’s leading manufacturers of Plate Heat Exchangers (PHE). Tranter provides their customers in the oil and gas industry with a broad range of plate heat exchangers for energy recovery in dehydration, desalting, sweetening, produced water and LNG (Liquefiable Natural Gas) processing systems. Tranter’s mission is accomplished by a global sales and distribution network that focus exclusively on plate heat exchangers. The gasketed PHE is a cost effective alternative to conventional shell and tube heat exchangers and the all welded PHE is designed for critical (high pressure / temperature) service applications. 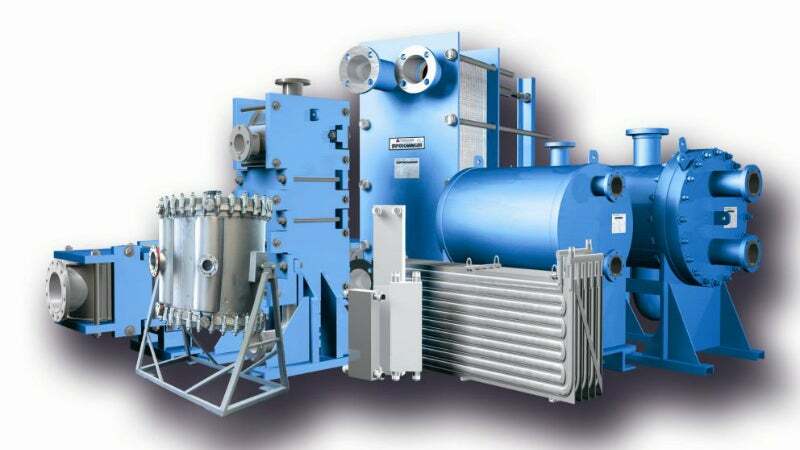 Historically the shell and tube heat exchanger has been widely used in oil and gas processing. However the compactness and higher efficiency of the plate heat exchanger makes it a very attractive option. Tranter Ultraflex is a patented plate design that has successfully replaced the shell and tube in a large number of plants. Tranter’s heat transfer plates are available in corrosion resistant materials such as 316L, 254SMO and Titanium. The plates are being manufactured in Europe (Sweden and Germany), Asia (India and China) and Americas (USA). All factories have ISO 9001 certified quality systems and ASME U-Stamp (U1) certificates. Gasketed plate heat exchangers are typically used for fluids with a design pressure / temperature up to 25barg / 180°C, such as crude and lubricant oil. A movable cover allows full access to the heat exchanger internal for easy maintenance. The gaskets are available in elastomers such as NBR, EPDM and Viton. The all welded plate heat exchanger is a relatively new product in the oil and gas industry designed for high pressure / temperature systems. Tranter’s all welded units Supermax and Ultramax are compact and efficient designs suitable to replace the shell and tube exchangers in certain amine applications (TEG, MDEA, MEG) for gas sweetening. Tranter’s spiral heat exchangers are utilized for a wide variety of applications for process industries. The flexibility of the custom-made tailored design allows the HEs to be used as heaters, coolers, interchangers, condensers and evaporators. The complex characteristics of the fluids involved in oil and gas processing influence the mechanical and thermal design of the plate heat exchangers. Tranter aims to provide customised solutions that take into account future processing problems such as scaling (fouling), emulsion formation, wax deposition and hydrate formation. Tranter works closely with Engineering Procurement and Construction (EPC) contractors to ensure that process parameters are selected to obtain the best performance of the PHE. Tranter’s success has resulted in many installations on Floating Production Storage and Offloading (FPSO) vessels and onshore facilities around the world. Tranter is pleased to announce to be exhibiting at this year's SMM in Hamburg on 6-9 September. Tranter has a global network of service centres that offers quick and reliable maintenance of your heat transfer equipment. Tranter is pleased to announce to be exhibiting at this year's FPSO Europe Congress on the 24 and 25 February 2016 at the ILEC Conference Centre, London, UK. Gasketed and all-welded heat exchanger units have been supplied for offshore crude oil processing duties on the Marlim Sul FPSO (Floating Production Storage and Offloading unit) by Tranter PHE, one of the world’s leading specialists in the design and manufacture of heat exchange technology.